Litigants Alfredo Figueroa (Yaqui/Chemehuevi), Phillip Smith (Chemehuevi), and Reverend Ron Van Fleet (Mojave) complain that the government and the companies involved in the utility scale buildout of renewable energy in the Mojave desert have lent a deaf ear, which has brought a new level of anxiety and spiritual pain to people who have long felt their voices muffled in the face of commercial development by others. Ivanpah is a 5-square-mile enclosure on the ancient Salt Song Trail, which stretches through four states. There are hundreds of sacred sites along the way, whose spiritual significance has been compared to temples. Native Americans stop at them to pray, while on spirit runs. “These runs would last weeks, if not months, and (participants) literally might spend all day running, literally running, from one state to another. By putting up the fence, you are essentially requiring them to take a detour from “Point A” to “Point C,” except “Point B” is religiously significant,” said Cory Briggs, the lawyer for La Cuna de Aztlán Sacred Sites Protection Circle, Californians for Renewable Energy, CAre and six Native American elders. Mojave elder Reverend Ron Van Fleet said the rituals he preformed at Ivanpah cannot be meaningfully replicated, in accordance with his tradition and values, at any other location. He is no longer able to do this because there is a fence around the solar facility at Ivanpah. “We have nothing that tells us there is something of significance here, unless every point along the trail, or several points along the (Salt Song) trail are of such significance,” said the Department of Interior’s lawyer, Robert Oakley. “If the federal government decided tomorrow, that its going to build solar facilities on every one of these historical markers, you can be darned sure we’d be filing a lawsuit,” said Briggs. The present case dates back to 2010, when the litigants filed suit against the Department of the Interior, Bureau of Land Management, and the Department of Energy, for their failure to consult with the tribes on 6 of the first industrial solar projects slated for the California deserts. Though the judge has yet to announce his decision about Invanpah, there is another controversy brewing on the neighboring hill. According to Lloyd Gunn of the Sierra Club Desert Committee, a transmission line is being built close to another sacred site. PHOTO: LUNDAHL “Who Are My People?” Documentary Film ©2015 Robert Lundahl & Assoc. Gunn took part in the Spirit Run up Metamorphic Hill that is shown in Robert Lundahl’s documentary Who Are My People? There is a still of them worshipping in front of two ancient triangles, composed of hundreds of rocks, at the top of this page. 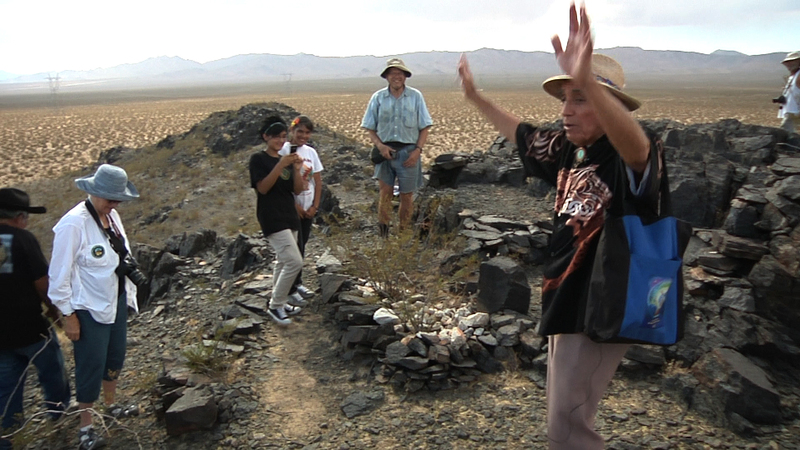 Chemehuevi Cultural Monitor Alfredo Figueroa is shown with his hands raised up, as he gives thanks to the Creator. The white triangle is filled with quartz. Figueroa said it is a geo-locator pointing to Spirit Mountain in the Southeast. 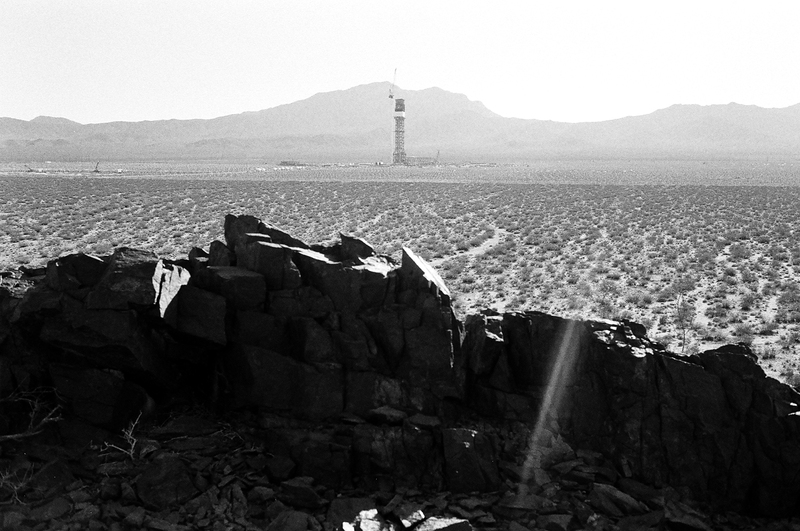 Spirit Mountain is called Avi-Kwame in the Mojave language. In the Uto-Aztecan worldview it is referred to as Tlalocan. It is an altar with prayer rocks, that Gunn believes is hundreds if not thousands of years old. The black arrow, or triangle, points to the Clark Mountains to the Northwest, the location of hot springs. Figueroa says the Salt Song Trail connects the two. “I called BLM at Needles, and talked to Mike Ahrens, the field manager, and he directed me to his archaeologist and I was told there was no such thing as a sacred site out there,” said Gunn. When the ECOreport phoned Needles, Mike Ahrens admitted he does not know where the site is. He never-the-less insisted it is outside the footprint of the project. Ahrens said he has heard reports “from non-Native Americans,” but no Native Americans have mentioned it during the year he has been at Needles. 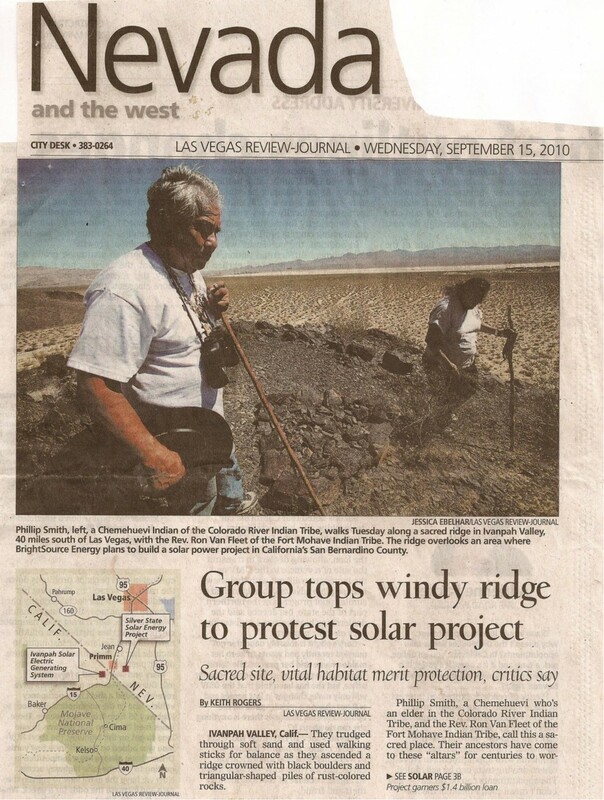 However a photograph on the September 15, 2010, Las Vegas Review-Journal depicts Chemehuevi elder Phillip Smith and Mojave elder Rev. Ron Van Fleet beside one of the triangles. “We’re reaching out to Phil Smith because we’d like to get his take on this. 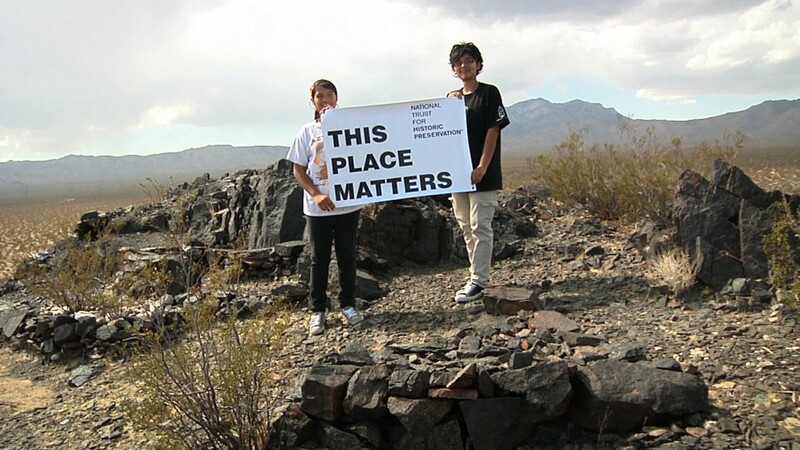 If the Chemehuevi share this concern then we want to address it,” said Ahrens. There have been many incidents in the Native American struggle to exercise the same rights everyone is guaranteed under the First Amendment. A scene in Who Are My People? documents the German company Solar Millennium bulldozed two of the ancient geoglyphs at Blythe. One of them, the True North Geoglyph, was 50 feet long. Alfredo Figueroa said none of the Quechan and Mojave elders were given advance written notice of the meeting at Blythe City Hall, on July 23, 2013. If he hadn’t been tipped off the day before, they would not have been present at a scoping meeting discussing the solar projects at Blythe and McCoy. “This is the most sacred site of the world and it was the worst location for the solar company to place these massive solar projects. It is where the spirit of El Tosco descends down from Tamoanchan and is the center of the Creation story,” said Figueroa. PHOTO : LUNDAHL. Leica M6, Ilford HP5, 50 mm. Summilux. They did not stop Brightsource from building Ivanpah, but the tribes want access to their sacred site within the facilities fence. “Are you saying that all you want is for them to open the gate when an Indian comes and let them run through it and then you can have the Ivanpah project?” the Judge asked. 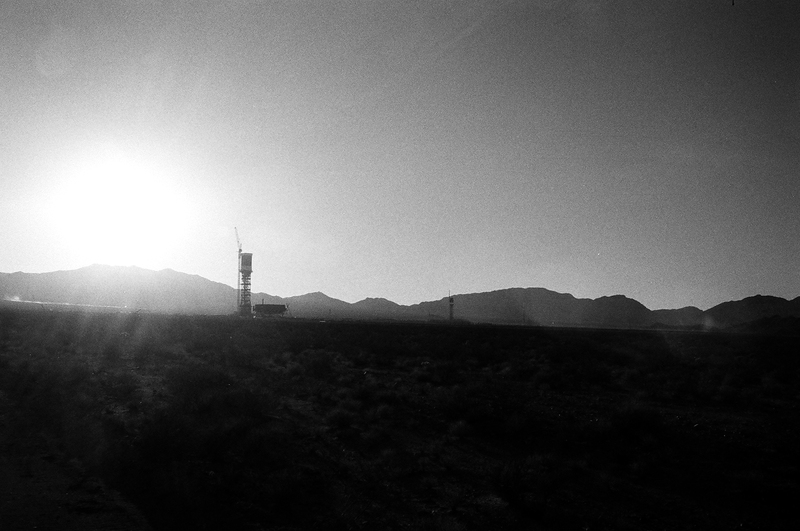 The judge is not expected to make his decision regarding Ivanpah, for months. The larger issue has yet to be addressed. Sometimes it seems like the freedoms we hold dear, the fundamental pillars of democracy, provide benefits for and are agreed upon by all. The First Amendment guarantees freedom of religion and the right to express this as we see fit. In light of what is transpiring in the desert, we must consider that the level of racial and cultural antipathy towards Native Americans is so deeply ingrained and so vicious, that the presumption of the government may well be that the rights accorded to every other individual and group do not apply. For the most part, that seems to be fine with them. Or is it? There is something highly symbolic in Cory Briggs fight to open a gate. Let’s hope that gate provides a pathway to respect for the Constitution and for people. Image at top of page: PHOTO: LUNDAHL “Who Are My People?” Documentary Film ©2015 Robert Lundahl & Assoc.